WORKSHOP SUCCESS:The Gemini Brett Fall Workshop was STELLAR! The October Lecture & Workshop for the Astrological Society of Austin was packed full of memorable moments and cosmic information about the ‘translation of light’ & ‘curing your blindspots’. We started off with Brett Joseph & partner Ana Zaharia arriving to a warm reception at Vaqueros Restaurant on Thursday night. (Special thanks to both Evan Hernandez and Charlie Cross for picking up both our special guests at the airport! )Board member Jeannie Goldwire met with all of us Friday for another wonderful arranged social visit and then took our guests for a quick tour around Austin. 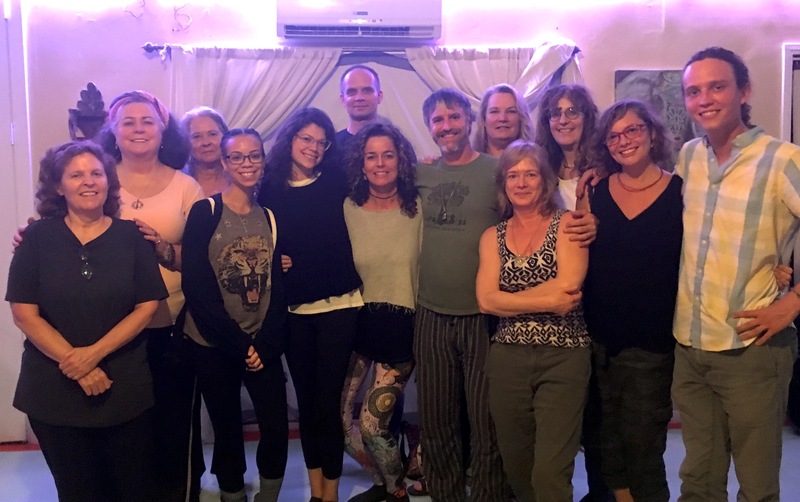 Despite the frenzy of the local ACL Music Festival, we had a wonderful turnout for the Friday night lecture at the AOMASchool for Oriental Medicine and a late night dinner afterwards at Hyde Park with several local astrologers! And WOW, we could not have ordered better weather for the Saturday workshop. In the midst of weeks of rain and continued forecast for more rain, the sky opened up on Saturday and instead we were treated to warm temps & sunny skies! Just for about 24 hours, then right back to more rain and an unseasonable cold front. We ended up sharing the whole day and being with about 75% of those we started out with. Some stayed into the evening, while others arrived in time for the night time ritual and Sky School. We wrapped up the evening with some ceremony and OMing, with a little bit of humor as well.